If you're on the hunt for a casual yet sharp getup, team a 1901 trim fit solid denim dress shirt with beige chinos. Both pieces are totally comfortable and will look great paired together. Up the cool of your getup by completing it with dark brown leather double monks. For a casually elegant ensemble, reach for a 1901 trim fit solid denim dress shirt from Nordstrom and navy and white vertical striped dress pants — these items fit really wonderful together. Break up your getup with more casual shoes, such as this pair of white low top sneakers. 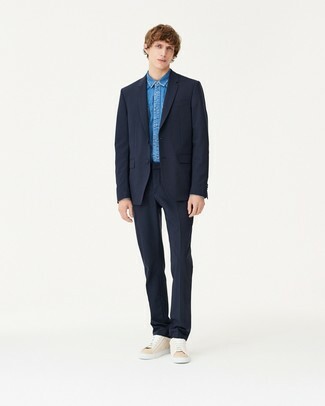 A 1901 trim fit solid denim dress shirt from Nordstrom and a navy suit is a greatcombo for you to try. Grab a pair of beige suede low top sneakers to loosen things up. 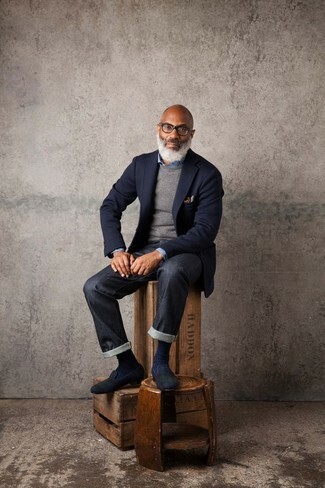 We all getup for comfort when it comes to dressing up, and this combination of a 1901 trim fit solid denim dress shirt and navy skinny jeans is a wonderful example of that. When it comes to shoes, this outfit is complemented wonderfully with beige low top sneakers. 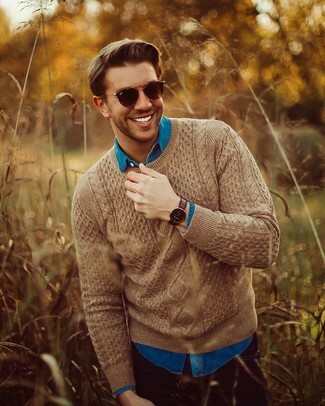 Consider wearing a blue denim shirt and navy jeans for a casual kind of sophistication. As for shoes, complete your outfit with a pair of dark brown leather boat shoes. 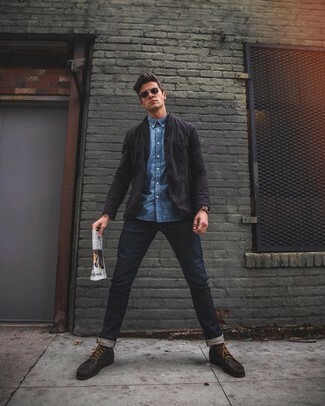 If you're searching for a casual yet dapper getup, pair a 1901 Trim Fit Solid Denim Dress Shirt with navy jeans. As well as very comfortable, these two pieces look great when paired together. Let's make a bit more effort now and go for a pair of brown suede casual boots. 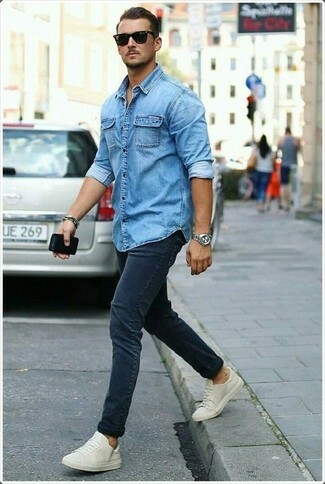 If you're after a casual yet on-trend look, try teaming a blue denim shirt with black jeans. Both items are totally comfortable and will look great together. To add more class to your look, finish off with navy and green plaid suede loafers. 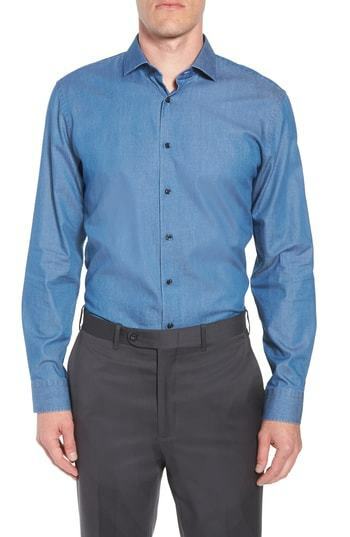 A 1901 Trim Fit Solid Denim Dress Shirt and black jeans? 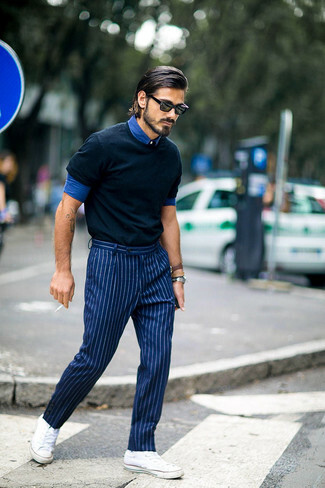 This is an easy-to-style outfit that any man could work on a day-to-day basis. 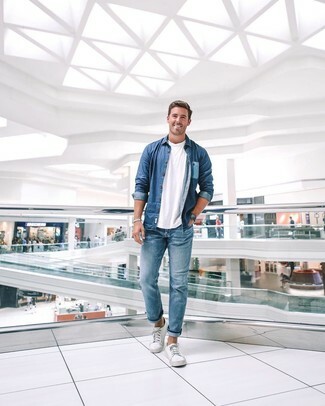 This off-duty combination of a blue denim shirt and blue jeans is very easy to pull together without a second thought, helping you look awesome and ready for anything without spending a ton of time searching through your wardrobe. 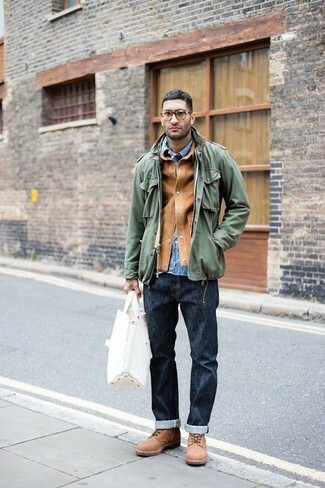 A pair of white canvas low top sneakers is a great idea to complement this outfit.